With us, getting a screening in Lewes, DE has never been easier. We've taken the hassle out of getting a check for sexually transmitted diseases in the 19904 area and simplified it into our easy, fast three step process. 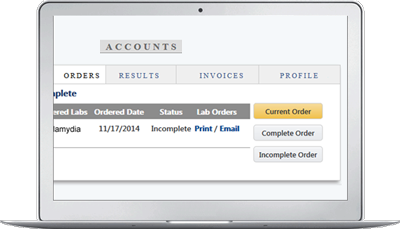 You can place your order with us online or over the phone, bring your order to the lab, and then receive your results. With a variety of screening selections to choose from, 4,000 labs nationwide, and among the lowest std lab test prices on our services, you're sure to have a positive experience with us. Why choose us for STD testing in Lewes ? Not only do we offer among the lowest std lab test prices on all of our screenings, but we also make it convenient for you to undergo a check. We offer many locations in close vicinity to the Lewes area for you to choose from. Our three step process is fast, easy, and affordable. You can even get screened on the same day that you order. Your STD testing Lewes lab visit will only take 15 minutes and does not involve any uncomfortable swabs or physical exams. The quality of our patient care is unrivaled. We take your health, privacy, and well-being seriously. We use the most advanced testing methods on the market so you can rest assured that the results you receive will be accurate and trustworthy. Why settle for anything less? You can rest assured that you're in good hands with the experience staff at our STD testing Lewes laboratories.